How Can Palestinian Reconciliation Efforts Save the National Project? The national reconciliation meeting that convened all Palestinian political factions in Cairo on November 21-22, 2017, concluded with a statement that referred to past reconciliation agreements and called for the activation of several committees, whose ability to produce meaningful results remains to be seen. 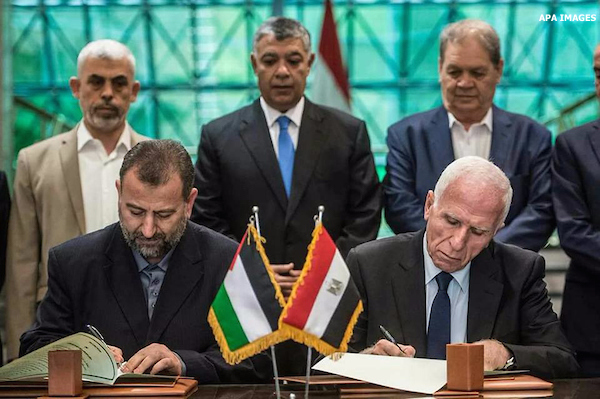 True, the Palestinian Authority (PA) resumed its duties in the Gaza-based ministries as per the October agreement signed by Fatah and Hamas in Cairo under the watchful eye of Egyptian President Abdel Fattah el-Sisi, and Hamas has shown positive good will. However, if anything, the Cairo meeting was a sign of the weakness of the Palestinian movement and its inability to deal with either internal or international pressures. Barring so far limited opening of the Rafah crossing by Egypt, there has been no appreciable improvement in the lives of the Palestinians in the Gaza Strip in terms of access to basic services like electricity, clean water and sanitation, health care, or reconstruction. To understand why it is so hard to achieve national unity, it is worth examining the intricacies of the issues that Fatah and Hamas must resolve, as well as Israel’s own objectives. Amending the Charter: What’s in It for Hamas? Israel believes the current attempt at reconciliation is doomed to fail like the 11 before it (whose failure it often helped to ensure). However, should this attempt succeed, Israel is waiting to see how the process will be implemented on the ground, and how it can manipulate it to serve its security interests. Israel wants to see the PA in full control of the Strip and apply the same policies it does in the West Bank, particularly with regard to security coordination and prevention of attacks against it. In such a scenario, Israel would effectively regain ultimate security control over Gaza and avoid having to make concessions (albeit short lived) in exchange for a truce with Hamas, Islamic Jihad, and their allies. Control of the border crossings by the PA’s security forces would guarantee stability in adjacent Israeli settlements, prevent smuggling of weapons into Gaza, and could lead to a Palestinian effort to disarm the resistance groups. Israel also knows that PA President Mahmoud Abbas will not allow Israeli prisoners to be held captive in the territories under his control. This could facilitate a breakthrough in the Hamas-Israel prisoner exchange being negotiated under Egyptian auspices, which would be a win for Israeli Prime Minister Benjamin Netanyahu. His government has been accused of indifference to the fate of the Israeli citizens held by Hamas as well as to the recovery of the bodies of two Israeli soldiers killed in the 2014 Israeli attack on Gaza. Israel’s position in a prisoner exchange has recently been strengthened by the fact that it now holds the bodies of five of the 12 Palestinians it killed in its end-October bombing of a tunnel east of Khan Younis under the wide “buffer zone” it has created along its border with Gaza. That attack was also intended to send an Israeli message to the Palestinians that any reconciliation agreement should deal with the issue of the tunnels. Should the PA fail to disarm Hamas, Israel could freeze its relations with the PA at any time and cite the lack of a Palestinian partner for peace. It could even claim that the PA is complicit with Hamas. In short, any reconciliation not on Israel’s terms will face serious difficulties and will likely have to keep restarting from square one. Separately from the obstacles Israel would create, the issues that must be resolved by Fatah and Hamas to achieve reconciliation have only grown in complexity. They revolve around four main axes. The first is the formation of a national unity government. Hamas is unlikely to comply with the conditions of the Quartet (the US, Russia, the European Union, and the United Nations) to recognize Israel, commit to nonviolence, and recognize past peace agreements. Some Palestinians fear that if Hamas insists on refusing the Quartet conditions, all Palestinians, not just those in Gaza, will come under renewed sanctions and siege. Even assuming a best case scenario in which the international community and Israel are willing to turn a blind eye to Hamas’ participation in a unity government, especially if such a government includes figures who are close to but not members of Hamas, there is a risk of establishing a dual Fatah-Hamas system of governing institutions that would exclude independent Palestinian experts and other factions. In a recent Al-Shabaka policy memo Khalil Shaheen warns of the pitfalls of such a regime and the risk of reviving discord over government operations. It is worth noting another twist introduced in the statement of the just-concluded Cairo meeting, which stipulated that all would be done with full respect of the law. However, many of the laws Hamas passed and the systems it put in place during the 10-year period of division violate the law. This will be a difficult circle to square. The holding of elections is the second major block to reconciliation though it is high on the agenda of the agreement. Hamas has not yet forgotten its experience of winning the legislative elections in 2006 yet being denied the right to exercise its powers. Indeed, several Hamas legislators incarcerated immediately after the elections remain captive in Israel's prisons. Hamas’ participation in any elections is likely to require guarantees by the PA and the international community to recognize the results regardless of who wins. Yet having faith in such guarantees would be a challenge given that the Fatah-controlled PA would be betting on Hamas’ electoral defeat. The reform of the Palestine Liberation Organization (PLO) is the third stumbling block. The Document of General Principles and Policies announced by the former chief of Hamas’ Political Bureau, Khaled Meshal, in Doha last May set out a positive position toward the PLO. However, Hamas insists on maintaining its position of rejection of Oslo, its right to resist occupation by all means, and its refusal of security coordination with Israel. It also believes that, within the PLO, Fatah has monopolized Palestinian decision making since the organization’s inception. Regardless, real PLO reform is not achieved by including Hamas and Islamic Jihad, but by reforming the organization’s structure and ensuring the full participation of all Palestinians in Palestine and abroad in the decision making process. Real reforms also demand a participatory political program to prevent monopoly over fateful decisions and an inclusive leadership to replace the traditional leadership that impedes reforms. Last but not least is the question of armed resistance. The PA refuses the existence of any arms that are not under its control and rejects the model of having a resistance movement within a state, as in the case of Lebanon's Hezbollah. By contrast Hamas views its arms as a tool for liberation and refuses to disarm before achieving liberation and establishing a Palestinian state. This issue will be an obstacle to reconciliation if no agreed formula is found. The Palestinian cause is at a critical juncture because of regional and international developments. The main disagreement between the different parties is largely over the political program rather than power sharing and government, even though neither program has achieved Palestinian rights. It is vital to reach consensus on a joint political program on which to base a fully inclusive national agreement. Some proposals are made below. Reconfigure the relationships between the components of the Palestinian political system in order to clearly demarcate the scope of political control and the functions of the PLO versus those of the PA. As part of this process, revisit the representation of Palestinian factions and organizations in the system so as to ensure real representation and greater participation in policymaking. Introduce mechanisms for political participation through elections. Periodic free and fair elections would provide for accountability and prevent the monopoly of power and exclusion that has persisted for decades. Energize community participation in national Palestinian decision making by soliciting the views and experience of think tanks, civil society institutions, local government, trade unions, and grassroots organizations, and establish organizations to monitor governance and government performance. Communicate with the Palestinian people in the diaspora, within the refugee camps, and beyond to ensure that their representation is commensurate with their political and economic weight, to strengthen ties, and to engage them in national programs. The current efforts to unify the political system and Palestinian government institutions are important first steps to end the division. Both parties must come to believe that the division cannot continue, that the dangers facing the national cause are real, and that the Palestinian people refuse hegemony and oppression. They must press on with the resolution of the remaining issues, difficult as they are. 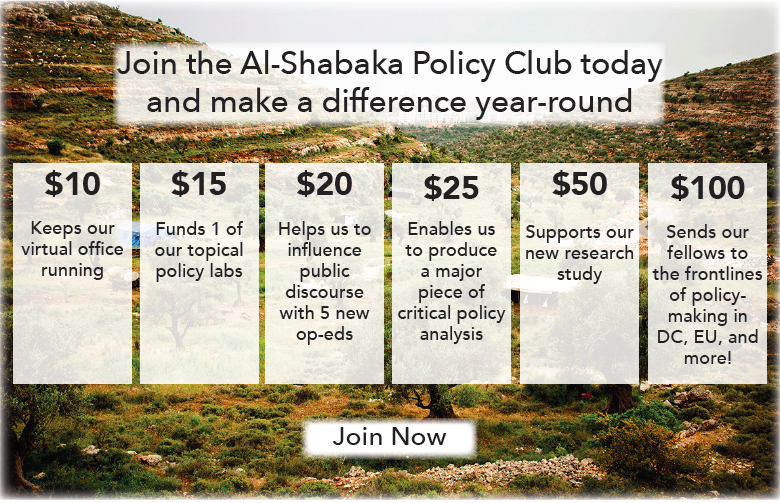 Al-Shabaka Policy Member Wajjeh Abu Zarifa is a journalist, researcher and professor of political science in Gaza, and a fellow at the University of Chicago. He holds a PhD from the Cairo-based Institute of Arab Research and Studies in political science, and a master's degree in Israeli studies from the University of Jerusalem. 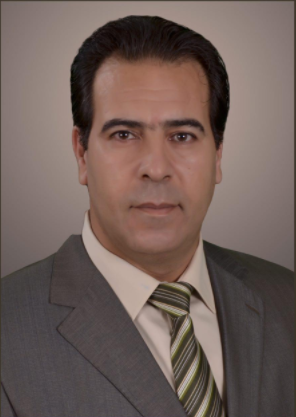 Abu Zarifa has participated in numerous international conferences and seminars, and published scientific papers and research as well as political articles and opinion pieces. He has worked in the press for 30 years with local and international media outlets including most recently NBC News. Abu Zarifa served in a number of community posts, including director of the PLO's national office for the defense of land and resistance of settlement, and a member of the Secretariat of the Palestinian Journalists' Syndicate.